Approval for massive extension of J-m Arab neighborhood paves way for future division of city, blocks Jewish development in key area. Prime Minister Binyamin Netanyahu approved Sunday night the construction of hundreds of housing units in Jerusalem and Maale Adumim, including 600 units for the Arab neighborhood of Beit Safafa, expanding the neighborhood into Givat HaMatos and creating Arab territorial continuity across southern Jerusalem. The housing plan approved Sunday night includes 560 units in Maale Adumim, 600 units for Beit Safafa in southern Jerusalem, and 200 units in predominantly Jewish neighborhoods across Jerusalem including Pisgat Ze’ev, Ramot, and Har Homa. 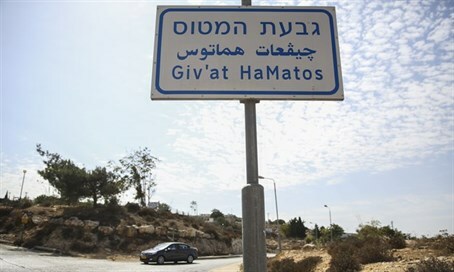 Givat HaMatos, currently a sparsely populated area with dozens of families living in caravans, has been the center piece of plans to link the Jewish neighborhood of Har Homa to the rest of the city. With the announcement Sunday, however, of the 600 new Arab units in Givat HaMatos, a continuous stretch of Arab settlement will be created, stretching from Beit Safafa to Sur Baher. Minister for Jerusalem Affairs, Ze’ev Elkin (Likud) slammed the move, saying that it threatened Jerusalem’s Jewish majority. Elkin called upon the Prime Minister to open up the area to Jewish settlement, including the construction of 2,000 housing units.